Hi Friends, Its long i have not released any blogger template for you as me too was not able to update my blog from long time.So a template after a such long time should be premium blogger template, so that every reader of mine should like it and can use it on there blogs.I wanted it to be so good that every viewer of it should get impressed with the design so much that he/she can’t wait to switch to this theme.Don’t worry it will be going to free but not less than premium template.I have tried my best to make it look best and work with full functionality as like wordpress.Speciality about this template will be that i am releasing this template into all 9 colors available in irresistible with an easy change of only 3 colors with blogger fonts and colors tool.Now i think you should watch an demo of it for sure. Just Don’t Forget To Check All The Colors Available For This Template From Fixed Drop Down Menu at Top Right Of Demo Blog. Now after uploading this template you would get the layout look like this in your blog. Find the below code and edit the Links and linking text with your own links and text. As you can see the links above are multi-level and you can have categories and its subcategories too placed in it, to make your menu deep to any level.All the Linking text above in red are Main Menu Items, In blue are Links in menu Itmes and in green are the Sublinks of Links Items.So you can make your top menu as you like.I am just explaining the format of defining it so that you can edit or make it very easily. This creates three menu links name Menu,Menu1,Menu2.Define any number of links within class nav to have more.This will create menu links. And place it below the link of menu for which they belong.Like it belongs to Menu1,so i will place them in this format i.e just after Menu1 Link.Now Menu1 Links will contain 2 links in it with name Link1 And Link2. And still you want to have sublinks for Link1.Just add links after Link1 In this format. Now a Menu Will be created with 3 Menu items Menu , Menu1 , Menu2. Menu1 Contains 2 links Link1 , Link2. And Link1 contains 2 sublinks Sublink1 ,Sublink2. Its so simple to add these links if you know little bit about html and to newbies unaware of any html part can be complex. And edit the text in red with title and in green with description. Top widget of home page sidebar is flickr.I would like that you should use it for sure for keeping template beauty.Just how to add flickr photos now.Just have a flickr account if not, and upload your photos you like. Now just add the below script to the flickr widget from your blogger layout as you can see there with name My Photos. And just change the red text with the photo id of yours as you can see it on your photo links in your account. As i have installed three tabbers in template and all working on one script.I have expanded the tabber script in blogger itself to work so as all of you can use it without bandwidth problems.So loading time of template can increase a bit.So if you not happy with it.Just take the script and upload to your own server and place it before the </head> tag in your template in below format.You will get the script with the download file of template. Just change the red url above with your server url. Note:-If you use tabber script in template of your own,don’t forget to find and remove the script i have expanded in template. 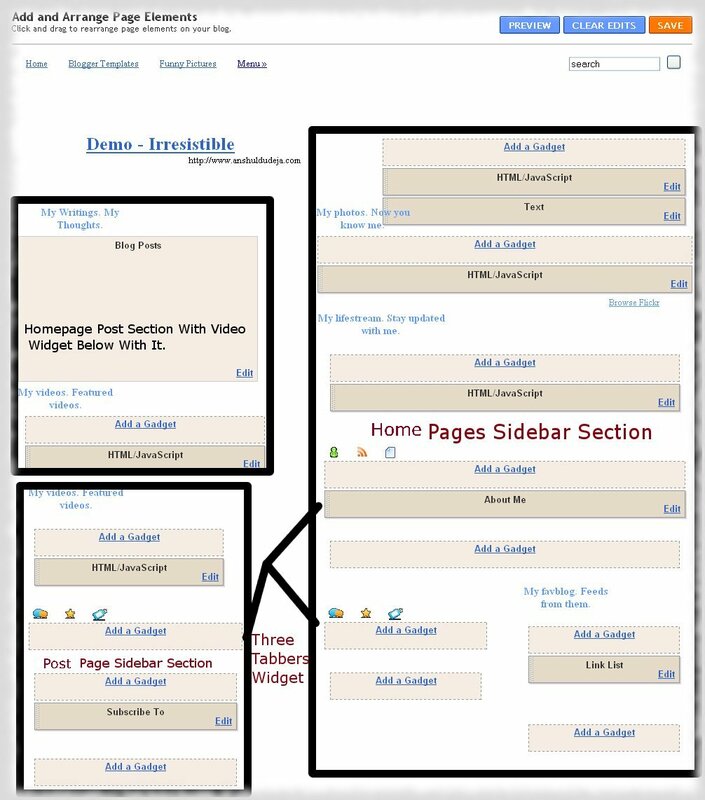 You will find four 125×125 adds fixed in your template sidebar.Just eiher edit them with yours links and images or remove below codes completely if you don’t want them. Hi as i have released this theme in 9 colors,so i wanted that users can switch to any theme they like at any time they want.So i made the switching of the theme very easy and will take hardly a minute to give new look to your template. As i have given you css file for all 9 colors you can use any color css you like but at any time if you want to switch to other color you will try to upload other color css but this will effect all your widgets so just read simple instructions to switch to other color theme within a minute. Just check for below codes in your template.You will get them at the beggining of your template codes only. Just change the red values of three colors and one background image in your template with values contaied in the other color styles and and your new color theme is ready.It will hardly just take a minute.So Enjoy It and have 9 different themes in 9 days. If You really liked the template and want full support for this template,just use the paypal button at my blog sidebar to appreciate my work and make my time worth,i spent on this template design. Dear Anshul, new templates (released and using for blog)- are looking nice. Keep it up! Hi dude…I have been searching for this template for blogger from many days…There is a problem with the download link..
@kanan Always read the complete post and then only comment for the issue. i hope u will be fine. I have uploaded this template. How can I add the color changer widget to my blog ? Please Help. This is the hack i implemented you can get install from there. @jeevan i checkd your blog source page the css you have uploaded is ok but there links are showing it as .txt file please save them as .css file to your desktop and then upload to opendrive and then chnage there links i.e you have uploaded files as .txt file not css thats mistake.Then it will work if you would have not mad any oher mistake. And PLease upload all files on your server. @sop you tabbers are working fine they can't stop as they hosted on blogger and you are using picasaweb picture or script in place of flickr only flickr would work fine as i told in post. Thank you! Your blog post will be advertised on the DigiFree Blog Layout Freebie search engine today (look for timestamp: 16 Nov [LA 05:41pm, NY 08:41pm] – 17 Nov [UK 01:41am, OZ 12:41pm] ). @mia you seem to become aware of codes well.YOu have implemented many things nicely.And about disqus i never tried it.As you said first me too will try on demo blog and will try to implement on the theme.I will comment here if i succeed in it. @mia ya sure i will check for sure its new thing for me i will try.As give some time and today i will be releasing another template thats why busy. All will be going to love it for sure. @mia i tried disqus on irresistible its gets added n comments well but the back ground problem was not solved as template is really complex to deal with . you have to waste time on codes with experimentation.I got like this but distorted. I would say to use default comments only. @mia if you still trying i suggest just first change the comment system i made for this as default to that of blogger style.Just change all css of comments and and its codes.Make it work fit. Then try disqus it might work for sure as i think. When I first installed Disqus – I had removed the Blogger Comment iFrame- I placed the Disqus inside the png background, but : when I installed the Disqus Recent Comments json , the dom tabs on the recent comments widget became distorted – so I was tired & just couldnt fight w/ the code and I gave up by removing it and just installing the Blogger comment form again -and now , Im fighting with PHP code ( which is even harder ugh ! :(( ) and between this & PHP , MySQL , FTP & XHTML – I believe I just may end up blowing up the www. ! :)) … maybe you should give this a go once you are done w/ the new theme youre working on – I am about to attempt implementing a beautiful pagination for this theme – once I get it right I will let you know – maybe you would like to implement it into the theme as well – it will be quite different from everything out there at present ! ( pray I get it right :)) ). When u hover ur mouse over Other Links, a menu will drop down. But because of the box "Showing posts with label Philip Larkin. Show all posts", my menu disappear. Is there away to not make it disappear. Also, if u clicked this link: http://thespiralstairwell.blogspot.com/2009/12/stubborn-creative-love.html , the drop down menu gets hidden behind the youtube video. How do i make the menu appear in front of the video? Would be great if you or anyone here could help me out. => But the painful bit is, you need to add it on every embed code for video. And remove showing posts with labels if you don't like it. Thanks alot! All done! Thanks for helping a stranger out. Appreciate it! second thing it's seems it won't work on my "test" site (http://shitlog.nl)…. @eddie i would suggest just download fresh codes of google minima default template and then upload it to your template and reset it. Now upload my template and download it again from ym download link so as no chnace of making mistake. I did a revert to the standart design and then to minima en then to your design but no look. Gonna try another one of yours i think. Took me a few hours but i think everything is perfect now. @mia i am impressed with your hard work you made it to work. I liked it a much.If you determine you can do anythng.If you need any advice or help in future just contact me i am always to service at bloggers who are passioante to it. All the best to you for 2010 & beyond ! First of all, I'd like not to have the posts on the main page stripped of html. I still want the formatting and the links on the main page, not only on the post page. Now I suppose you did this (removing html tags) for a reason – what are the problems that may appear if I change the removeHtmlTag function into one that simply extracts the first paragraph out of the post with the html tags? Second, I'd like x comments on the main page to link to the comments section (blog-address/post.html#comments) – what are the problems that may appear here if i enclose that within < a expr:href='data:post.url + "#comments"'> < /a>? @ana the codes of this template are very complex to make changes . As making change in post on one effect other. The best is to use this template as it is.As everything is perfect in it. I am not going to change anyhting in it its no need in it and will take a really waste of much time.So sorry friend for it.If u try to change one small thing you keep on going to change many other things to make it correct.I can suggest only use as it is, i can't give any help in this template bcz it would be totally waste of my time bcz me too has to work hard on its code to make small change. Great Template! Thx so much! Great design but hard installation. @fazlina something you made wrong or wrong widget added anwhere.And just read instaructions to implement flickr photos and link. @raj ya problem wih it.But with download link you will get xml fr all colors.You can use any u like and this feature of chnagung colors in not provided to you in template. I have uploadedthe temp fine but layout will not show me anything to adjust or edit?? Help. After a bit of work, I finally got your template integrated into my blog and everyone loves it! However, I'm having one small problem with the Date which appears above posts in large type (instead of small type underneath the posting title). Also, the full post is being displayed instead of only the first ten lines and the posts being separated by the little dashed line. I've been looking at this literally days, and I can't figure it out. did Blogger do something to the format? What would I have to do to edit the code to fix it? @lady you have not installed template correctly till now i think. Seeing many title images 2 times and post page not becoming big. POp up window will open Just uncheck date from there and save. Hi, your wonderful template is unfortunately uncompatible with plugin – jQuery Lightbox http://www.pedrolamas.com/projectos/jquery-lightbox DonÂ´t you know why? It is really pitty. When jQuery Lightbox activated, your sidebar TABS are not working at all. Greetings!